This week’s project comes from Rebecca. The kitchen chairs were looking a bit tired and shabby after 11 years of use. 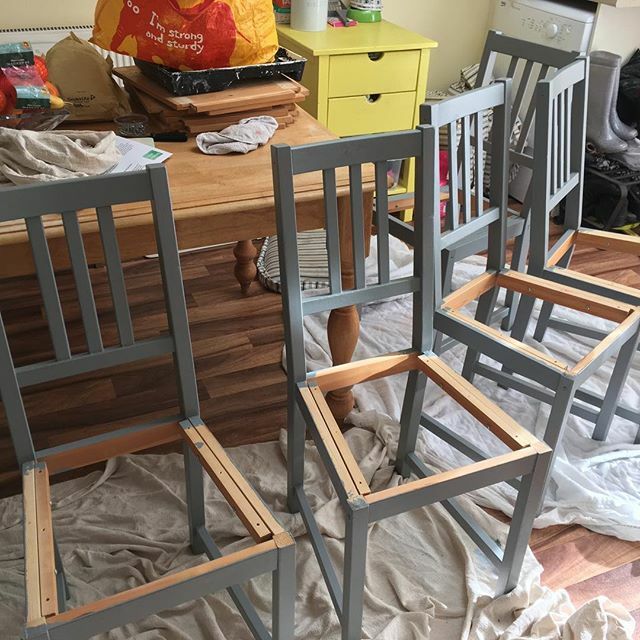 These Stefan chairs from Ikea are simple wooden affairs with a detachable cushion but they had various stains from craft projects and the wood was scratched by the cat. The first step was to strip them back to the wood. We’d added some wax a few years back for protection and realised that would stop the paint from bonding. After a lot of sanding with 120 grit sandpaper, we got them to a point where there could be painted. The sandpaper clogged up real easy so we got through a big number of sheets. The seats were removed as we did not need to paint those. The whole family got involved with the painting and we quickly had a couple of coats of “metropolitan” on the wood. Next up were the seats. We had a large block of memory foam which had previously been a mattress topper. This was chopped to shape with a fine-toothed saw. 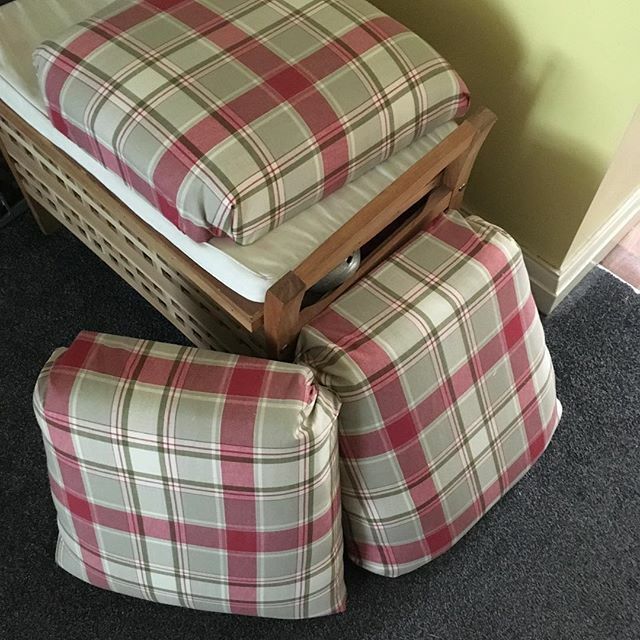 Rebecca had saved the material from our roman blinds and that got re-used as the seat covers which were simply stapled to the wooden base. Finally, the seats were screwed back on and the job was complete. 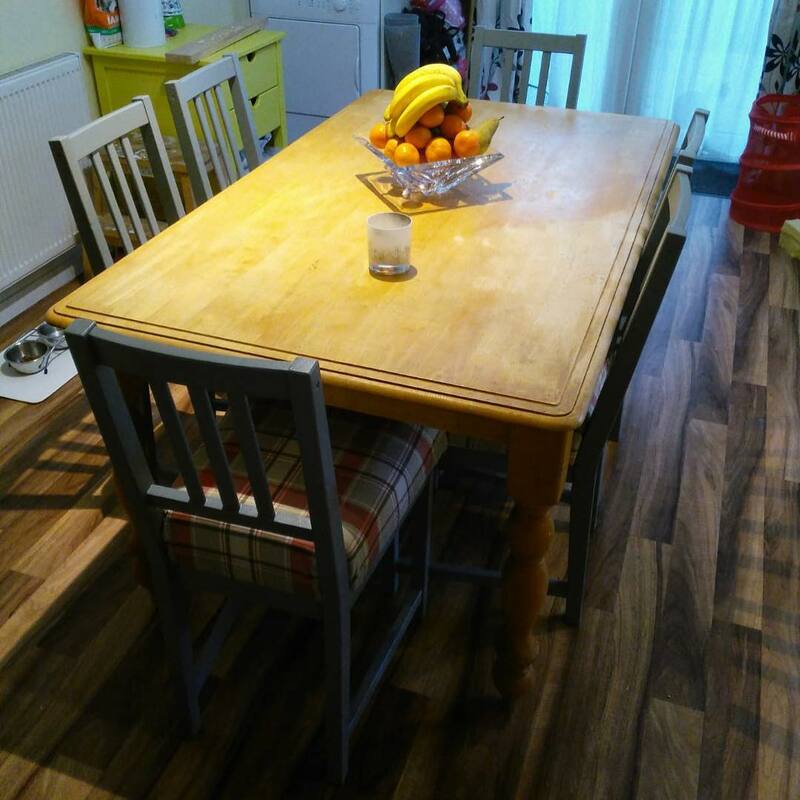 Next challenge is stripping back table and painting that to match the chairs. The plan is to paint the base and legs and to leave the top a very pale pine colour.